The Secret - Aroma Academy U.S.
At the heart of Aroma Academy’s training is a set of distinct aromas that combine to create the “tasting” experience. The aromas contained in each kit stretch across the stylistic breadth of the kit’s category — whisky, gin, etc. The training method is to build flavors up rather than breaking them down. The secret to this kind of training is the quality of the aromatic extracts. They must accurately portray not just the aroma of a freshly poured drink, but must change over time to reflect the changes that happen after time in the glass. Aroma Academy’s aromatic extracts are identified and isolated by Dr. George Dodd, a genuine eccentric and professional perfumer who has been (his word) “obsessed” with smell since he was a child. 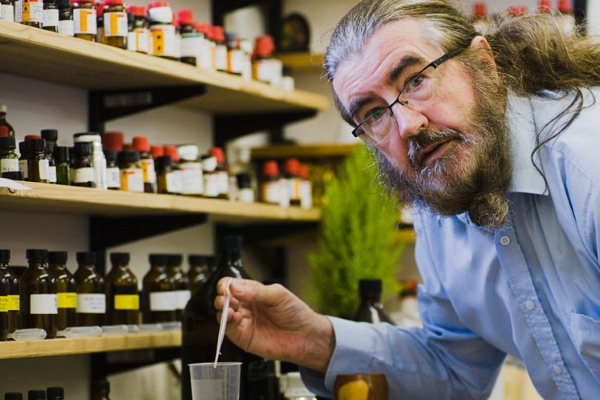 Dr. Dodd was long the only professional perfumer with a university post, lecturing in chemistry at the University of Warwick and directing its Institute of Olfactory Research. He has collaborated in the creation of hundreds of consumer products, both ingestible and not. Along with his conventional work blending aromas for soaps and colognes, Dr. Dodd has explored the power of smell in other, less conventional ways. For example, he supplied the aromatic materials for a smell-based art exhibit that toured the United Kingdom. It is Dr. Dodd’s exceedingly well-developed nose that detects nuances most of us never will, enabling the re-creation of the precise aromas that make a drink distinctive — whether it’s the soft touch of roasted nuts in Scotch or the chamomile in a craft gin.